A bar from each of the batches of soap I’ve made so far. They can be bought at agape1.net/store/catalog/ except for that lavender one. I’m not really selling that one since it was my first batch and doesn’t even smell like it’s supposed to. 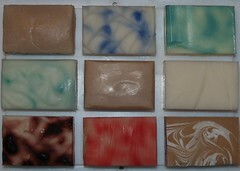 I love the bottom right soap – the swirl is very crisp and clean. And Gapey, don’t worry too much about your first batch of soap not smelling like you wanted. It happens to all of us. September 21, 2010 Update: Hi everyone! Just wanted to give you a new link. You can now buy these fabulous soaps at the Sultan Scents Etsy Shop. The link in your blog post to my store doesn't work anymore. Can you update it to show http://www.sultanscents.com? thanks. It’s great that you sold out over Christmas! After all, it’s a nice excuse to need to make soap again and even better, maybe you got to make some extra money over the holidays with your soaping hobby? Hey just noticed you posted a pic of my soaps on your blog. 😀 I need to make more! My inventory got pretty whiped out from all those Christmas orders I got. I’ll try to get the link fixed in the post. Thanks for noticing! I tried to click on the link to see her collection, but it sort of went no where. Can ou give the addreess again?